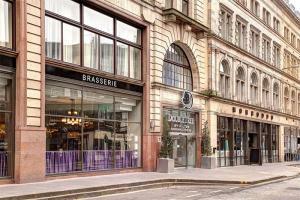 Built in 1892, this historic hotel was originally the art-deco inspired St. Cuthberts Co-operative. The hotel is set in the heart of Edinburgh and offers fantastic views over Edinburgh Castle. A vibrant local community of restaurants, bars and shops are a mere ten-minute walk away. Rooms and suites, many featuring views of Edinburgh Castle, offer a comfortable respite, with Sweet Dreams® beds, Wi-Fi and other amenities. Enjoy close proximity to major attractions including the charming Old Town, Holyrood Palace and the Scottish Parliament. Located in the heart of Edinburgh, just 7 miles from the airport.